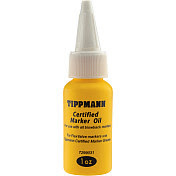 Formulated specifically to keep your Tippmann marker operating at peak performance. For use with all blow back markers: 98 Custom, A-5, U.S. Army, TPN, SL68-II, and X7 (non-Phenom). Comes in a 1 oz. bottle.